So, this is beginning of the (hopefully) last edition of the fish tile shower project. This time, I'm making a wrap-around band of fish with a free flowing-design. And, the guy who is installing my new floor and tub surround has agreed to mount my band-o-fish tile too. Whew! This is the corner of the east wall with the design impressed and the grout lines cut out. When the tile is installed the grout lines will disappear. At least theoretically. At this point, I'm not doing a lot of predicting. The tiles will be almond/white and the grout will be white also, so it should blend well. I measure the bottom of the slab using a steel ruler that has the inch measurements right out to the end--some yardsticks have a 1/4 inch 'fudge' at the end. I cut the whole length of the bottom. Then, using a large see-through architect's plastic triangle, true up the end at a right angle. (A carpenter's steel square works well too.) I use a transparent ruler to measure the width and cut the top of the tile strip. 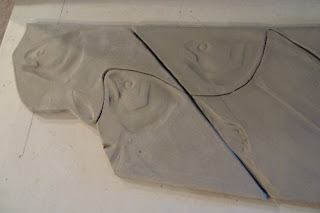 I press the pattern into the clay using the fish molds and smooth up the design. Since this distorts the clay, I re-measure and re-cut the strip to size. I do a lot of smoothing of the top and bottom edges with my fingers. 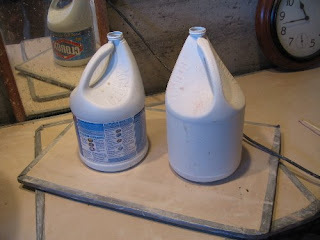 I put another scrap of drywall on top the strip and weight it down with big bleach bottles filled with water. (This is the small section of tile under the weights.) No warping allowed! Usually, I flip tiles every few days so they will dry evenly under pressure. This helps avoid cracking and warping. I can't flip these tiles because the impression design is so pronounced that they wouldn't lay flat. One serious crack and I have to start over. The grout lines are not cut until the clay is set up more. I look at the design and plot out the cuts thinking about flow of lines, how to avoid sharp joins or corners and think about the strength of the cut tiles. I lightly mark the clay with a sharp pencil and, using a fettling knife held vertically, cut the tiles out after the clay is set up to slightly softer than leather hard. If the clay gets too hard, the cutting knife will drag and make ragged edges. I leave the whole piece alone until it is easy to gently separate the individual pieces. I separate them, smooth the edges out and let them dry more. 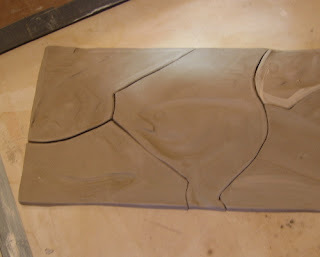 All the tile must get to bone dry before firing. I will fire them flat on the kiln shelf with alumina underneath to allow them to float on the shelf. That's another good trick to avoid cracking. The south wall is a bit longer than any of my drywall, so I had to figure out how to break the design without running into obvious join problems. So, I decided it should be off-center and about a 1/4th section and a 3/4 section to further avoid an obvious join. I cut the two at an angle and here, the photo shows lining up the two sections to check design continuity. I decided on a 45 degree angle for the join so that I could be sure of a match-up.